Alexander Stuart Hull Moody was a 19 year old University of Queensland engineering student - residing at the Presbyterian College in Wickham Terrace called Emmanuel College - when he enlisted in the 1st AIF in June 1916. He subsequently served with the 4th Australian Pioneer Battalion in France and Belgium, being gassed and wounded, and returned home in 1919. Post-war Stuart tried working as a jackaroo but this proved too much for his health – which before the War had been very good. He subsequently worked in the Queensland National (QN) Bank and was the accountant at the Oakey Branch of the Bank when he died suddenly in 1933 of bronco pneumonia, at the age of 36. For convenience ‘Stuart’ is used in this account – that’s how he was known in Warwick when young, and he enlisted as ‘Stuart Hull Moody’. However, it should be noted that he used ‘Alex/Alexander Stuart Hull Moody’ for some official purposes, and post-war he was often called ‘Alec’. 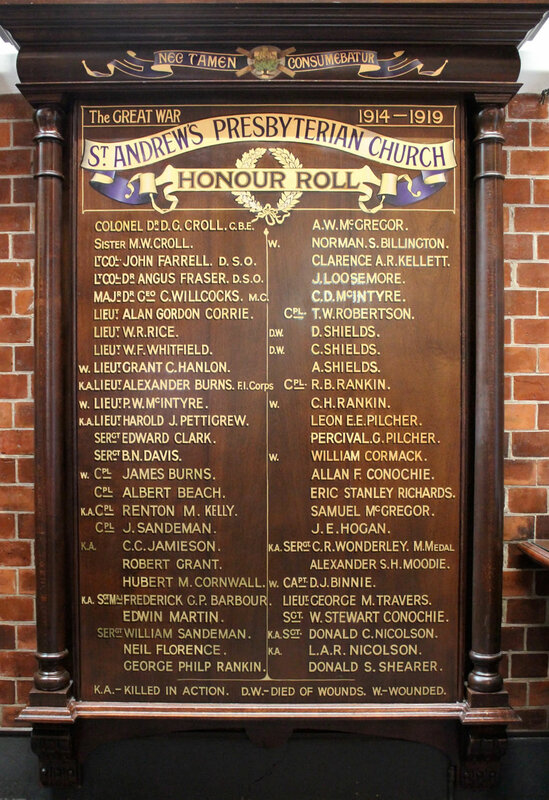 An added element to the research challenge was that the relevant Honour Board in Saint Andrew’s Church in the Brisbane CBD incorrectly has his family name as ‘Moodie’. Stuart was born in Barcaldine on 29 November 1896 to Melbourne-born Andrew James Alexander Moody, a bank manager and Elizabeth née Cooper from Aberdeen, Scotland. They had married in 1880 with Anglican rites at Tambo, Queensland where Andrew was working, and by 1896 when Stuart was born they had one other son (Vernon Hull) and three daughters (‘Laura’ Edith Hull, Irene Eleanor Hull and Mildred ‘Olga’). Andrew and Elizabeth were very active in the communities where Andrew was posted for work. After Tambo the couple spent 19 years in Barcaldine and were held in high regard there – Elizabeth played a leading part in the establishment of the Victoria Hospital in 1887 and she and Andrew gave ‘zealous and incessant services’ to the hospital. They also assisted the local Methodist Church, with Andrew being a member of the Church Committee. Following Andrew’s promotion to manager of the QN Bank branch in Warwick from 1901, the couple resided in Warwick for many years, and when Andrew retired from the Bank in 1922 he and Elizabeth remained in the town, making Haddington their home. ‘He was local Board of Advice for the Queensland Trustee Co. Ltd., and was associated with The Country Women’s Association, Warwick Benevolent Society, Warwick High School, and took a very keen interest right up to the date of his death in all movements for the betterment of the district’. Stuart attended the Warwick State School and then the Warwick High School, where he matriculated with the best Senior examination results in 1914. The following year he commenced engineering studies at the University of Queensland – the same year as E. B. Cullen, who is also listed on the honour boards. Stuart was also in the senior cadets for three and a half years, and was commissioned as a 2nd Lieutenant from late 1913, transferring at that rank from the 11th to the 7th Battalion when he was at University. While studying, Stuart resided at Emmanuel College, the Presbyterian University College in Brisbane - at that stage located in Wickham Terrace. Contemporaries of Stuart at Emmanuel included Fred Barbour and Charlie Wonderley. The Rev. Dr Ernest Merrington, a Minister of Saint Andrew’s Church and a Chaplain Colonel during the War, was closely involved with the early years of Emmanuel College, and was interested in the well-being of the students there. He may have had an influence on Stuart Moody – certainly Stuart gave his religion as Presbyterian when he enlisted in 1916. Stuart sat for one University examination – descriptive geometry – in November 1915, for which he received a pass mark. The University records show that he received a refund of enrolment fees, and the University Archivist has advised that this would have been because he had enlisted or was going to enlist. It was in Toowoomba that Stuart, aged 19 and a half, enlisted on 1 June 1916. He stood 164cms tall, weighed 51kg, and was recorded as having a medium complexion, brown eyes and dark brown hair. He embarked in Brisbane with the 6th reinforcements for the 4th Pioneer Battalion on the HMAT Boonah A36 on 21 October 1916, and completed the voyage at Plymouth on 10 January 1917. The reinforcements underwent a period of training in the Pioneers Training Battalion at Larkhill in England, and during this time Stuart was a temporary Lance Corporal. However, he reverted to the rank of Private when the group proceeded to France to be formally placed in the 4th Pioneer Battalion in May 1917, with Stuart being allotted to ‘C’ Company in the Battalion. Each of the five Australian Divisions had a Pioneer Battalion, which often worked under the direction of, or in co-operation with, the Chief Engineer for the Division. The Pioneers were also trained in the infantry role and could operate with the infantry or in their own defence if necessary. They were the most versatile unit in a Division - one description was of them as the handymen of a Division. Not long after Stuart arrived in the 4th Pioneers, the Battalion began working on new roads and helping with ammunition supply in preparation for an attack on Messines Ridge, and then laying duckboard tracks and digging key communication trenches as the attack succeeded and the gains were consolidated. Stuart’s repatriation file has some extracts from a diary he kept, and this reveals that on 8 June 1917 he ‘Had a rough time at work, and got a good dose of gas going back through the old trench work’. He was significantly affected for at least a week but struggled on. The following month while digging communication trenches near Warneton his unit came under heavy bombardment and were ‘gassed a little’. The 4th Pioneers were engaged in preparation and close support at Polygon Wood and Passchendaele later in 1917, although there was always plenty for the handymen to do between as well as during the major battles – beyond the activities already mentioned they repaired and maintained roads, built tramways, ddid drainage works, buried cables, improved camps, improved and maintained tunnels, dug and shored up dugouts, erected huts as well as concrete shelters and aeroplane hangars, and salvaged items such as timber, barbed wire, star pickets and machinery. After the winter of Christmas 1917, the 4th Pioneers helped with defensive works in preparation for a major German offensive, which eventuated in March 1918. Stuart himself was feeling sick and very weak in late March, and spent part of April on light duties. On 9 June 1918 Stuart’s Company took over some positions from the 51st Battalion, and Stuart noted in his diary that: ‘The Hun gave us much gas and high explosive’. In the following days Stuart felt ill and feverish, and on 13 June he recorded: ‘Paraded sick, against my will. Kept at RAP (Regimental Aid Post) for attention’. Two days later he was discharged from the RAP ‘not feeling too bright’. In the aftermath of the Battle of Hamel in early July 1918, Stuart was wounded by a high explosive shell as C Company was digging communication trenches to the new front line and front line support posts. However, he elected to remain with the Battalion and was transferred from his platoon to a clerical role. The Allies lunched their own offensive in August 1918 – Stuart was on leave in the UK at the time - and the Pioneers found themselves almost continually on the move as they went forward in support of the infantry to the Hindenberg Line. Stuart caught up with the 4th Pioneers towards the end of August and was promoted Lance Corporal on 23 September 1918. The Armistice came into effect on 11 November 1918. Stuart was temporarily made a Corporal on 28 December 1918, but reverted to his previous rank of Lance Corporal when repatriation to Australia loomed. He embarked on the HMAT Anchises A68 for Australia on 28 February 1919, and on arrival back in Queensland he was formally discharged on 28 May 1919. On demobilisation Stuart attempted to work as a jackeroo near Blackall, but was unable to cope. He then joined the QN Bank in September 1920, first working in the Kyogle and Wardell Branches in NSW - and it was in Methodist Church in Kyogle that he married Kathleen (‘Kitty’) Bright McPaul, on 20 June 1923. By 1925 the couple were in Queensland, at Forest Hill near Laidley, and two years later Stuart was promoted to accountant at the QN Bank branch at Oakey. After six years in Oakey he was about to be posted to Biggenden, when he succumbed to broncho pneumonia – said by his friends and the local newspaper to be ‘accentuated principally because of gas effects during war experience’ - and died in a private hospital in Oakey. Stuart was buried in the Oakey cemetery with Anglican rites - ‘the funeral being largely attended, eight bank officials of the town and district acting as pall bearers, supported by a number of returned soldiers’. He was survived by his wife and two children (seven years old Rhona Hull and six years old Lennox Hull). Kitty applied for a widow’s pension but despite her pursuing appeals against the initial rejection, Stuart’s death was not accepted as related to his war service. The Repatriation Commission view relied in part on the absence of reference to gassing in his service record, but the diary extracts were available to them, and not all wounds or injuries were included in the service records if the person involved was determined to stay and not let his mates down. For conscientious and self-reliant men such as Stuart Moody, assistance was to be sought only when unavoidable. Various friends and colleagues gave written support to Kitty’s claim, saying that Stuart didn’t seem in good health after the War but apart from a brief explanation that he had been gassed in the War, and when pressed a short comment that he wouldn’t apply for any pension or other assistance while he could still work, he was not one to complain and got on with earning a living as best he could. • Australian War Memorial – embarkation rolls, 4th Pioneer Battalion war diaries. • National Archives of Australia – service record and repatriation file. • Queensland births and deaths registers. • Daily Standard (Brisbane) 30 June 1915 p6. • Northern Star (Lismore) 20 June 1923 p9. • The Brisbane Courier 5 July 1916 p4; 29 May 1933 p15. • The Telegraph (Brisbane) 1 June 1933 p11. • Warwick Daily News 31 May 1933 p2. • Warwick Examiner and Times 31 December 1913 p5; 13 March 1915 p4; 22 November 1915 p5. • The Western Champion and General Advertiser for the Central-Western Districts (Barcaldine) 11 November 1901 p11. • Warwick Daily News 24 December 1919 p4; 2 August 1946 p2; 7 January 1949 p2; 27 August 1946 p3.